Outside of Iced Cube snow cones Monday, April 23, 2018 in Elsa. ELSA — Less than a year ago, the owners of Iced Cube raspa stand and their two young children were moving the single mattress they owned from one home to another after being evicted from a house they could no longer afford. At the time, Johnathan Segura, 28, a former oil field worker and his wife, Ashley Vasquez, 27, had a little less than $2,000 to their name. “When we say we started from the bottom, we mean the very bottom,” Vazquez said, lounging inside Iced Cube raspa stand in Elsa, unfazed by the 15-car line outside of her business. That’s “pretty much the norm now,” she said of the long line of cars. They even had to switch locations since at the first location the lines sometimes blocked traffic. 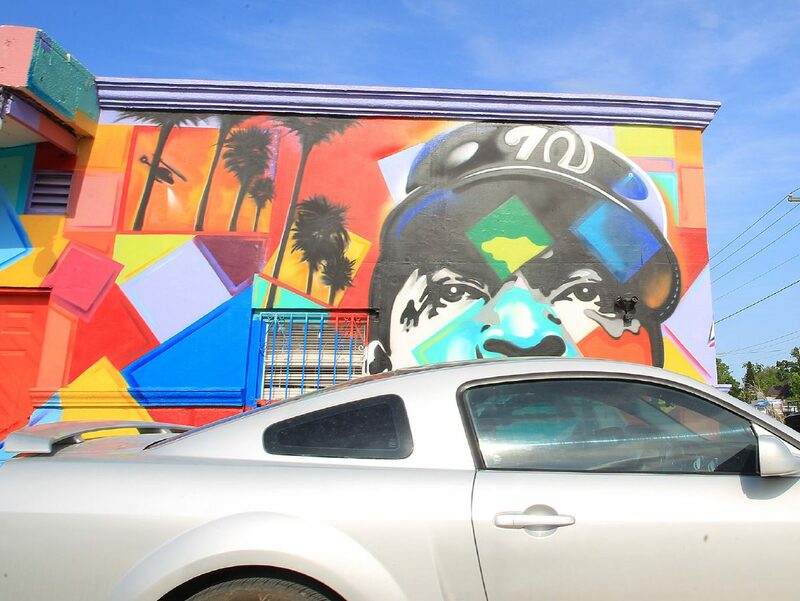 The new location is covered in an elaborate mural featuring celebrities such as Drake, Tupac and, of course, Ice Cube. Ashley Vasquez and Johnathan Segura pose in front of Iced Cube snow cones Monday, April 23, 2018 in Elsa. 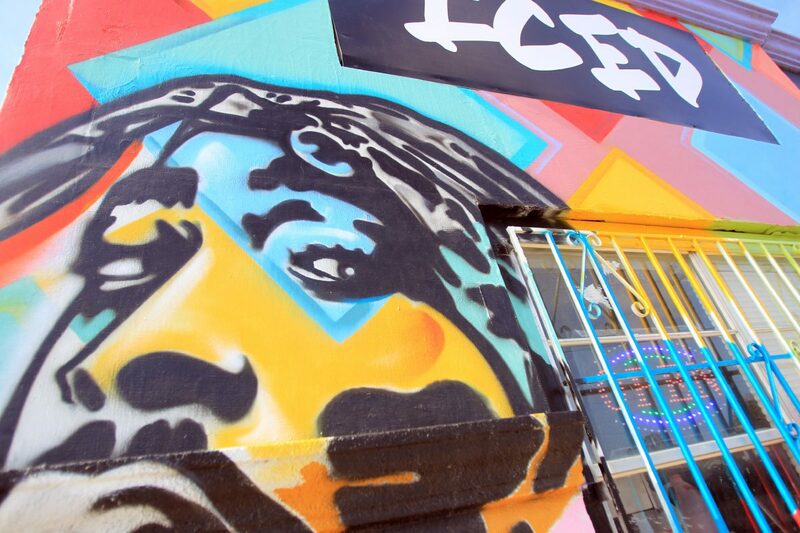 Patrons pull up to Iced Cube snow cones Monday, April 23, 2018 in Elsa. 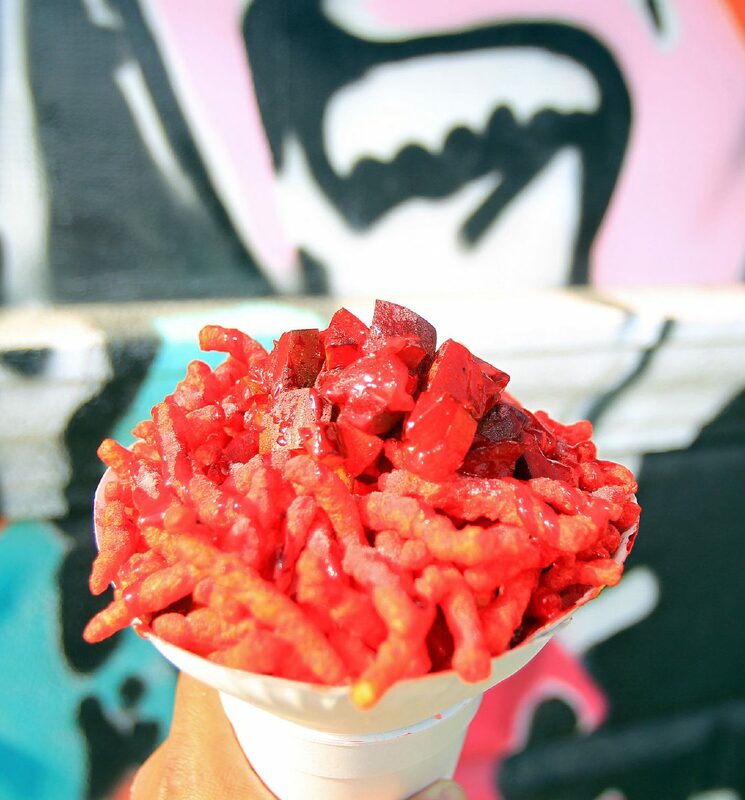 Hot Cheeto Pickle Dillie Iced Cube snow cones Monday, April 23, 2018 in Elsa. Now, in an effort to “not forget where (they) came from,” the raspa stand is offering five $500 scholarships to local students. The $2,500 is over $500 more than they had when they first opened 10 months ago, and the college-age students of the area are the ones they credit for their overwhelming success. It all began June 1, 2017, when they invested the little money that they had into the raspa stand. As soon as they started “adulting,” they knew they “wanted to have something of their own,” Vasquez said. The one employee they had, Joseph Segura (Johnathan Segura’s nephew) wasn’t even getting paid at first. The 23-year-old would work mostly as a favor, occasionally compensated with a free meal. As the stand was beginning to take on its identity, Vasquez decided she wanted to take advantage of a previously untapped resource: social media. In July, she posted an image of a specialty raspa called “Views” — the title of a Drake album — on Twitter and the post went viral. Soon, young people from around the Valley, and sometimes even as far as San Antonio or Corpus Christi, started flocking to the raspa stand to try the different snacks they’d seen on social media. According to Segura, about 80 percent of their clients are not from Elsa. Customers rarely order “flats,” they said. Most come asking for whatever extravagant concoction the couple posted on Twitter that day. He said most people ask for Hot Cheetos on their raspas now, and most of them require two inserted paper plates to hold the contents of the snack. Hot Cheeto-covered turkey legs, a “snowman” with Hot Cheeto eyes and arms are among the other unorthodox snack options that can be ordered on request. But, of course, whenever that customer leaves with their unique raspa, they snap a picture of it as well. Now, it’s not uncommon for them to make upward of $1,000 a day. The one employee they started with, Joseph Segura, was able to purchase his first car earlier this year and the business now employs more than 10 people. Those interested in applying to the scholarship will need to stop by the raspa stand and meet the owners when they pick up an application. They will be asked to fill out a form with their basic information and to submit a short essay. The deadline for the applications is June 1. They said they’re looking for applicants that “got that hustle in them,” among other redeeming qualities. “This our way of showing our appreciation,” Segura said.